I’ve watched us make incredible progress over the past two years in our efforts to put WTC 7 front and center in the minds of architects nationwide. 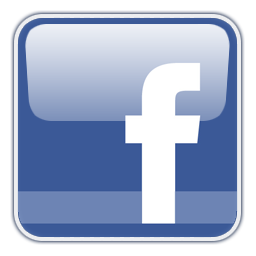 Now I’m asking you to help us take the next big step. 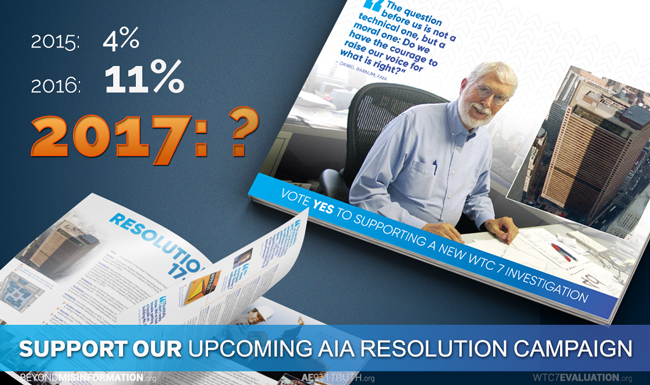 Last week, we learned that our resolution calling upon the American Institute of Architects (AIA) to officially support a new WTC 7 investigation was accepted at the national convention for a third year in a row (see page 34 of the Delegate Information Booklet). Although we found out at the last minute that the AIA now requires a signature from each sponsor, we managed to get 70 of our 225 sponsors to email us their signatures before the deadline. And so, on April 26th representatives of the AIA’s 90,000 members will vote on whether the AIA should add its powerful voice to the call for a new investigation. In 2015, we won 4% of the vote. In 2016, we nearly tripled our share to 11%. This year, our goal is to triple that number again — and perhaps even win. Unfortunately, after allowing us to exhibit at the past eight conventions, the AIA leadership has denied our application for a booth. We don’t know why they suddenly turned us down, because they declined to give a reason. But we’re not letting this stand in the way of educating our fellow architects. Even without a booth, we are still going to the convention, where we’ll be talking to hundreds of AIA members on the expo floor and advocating for the passage of Resolution 17-5. 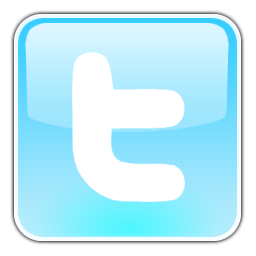 Send Our New Mailer to 2,500 AIA Leaders! We think last year’s threefold increase was for two reasons: One, we educated our fellow members by including the evidence of WTC 7’s demolition in the resolution. Two, we did a mailing to 2,500 local and national AIA leaders just before the convention. Our plan this year is to stick to that proven method. Our new mailer — which features an updated letter from me and a revised, attention-grabbing cover — comes on the heels of our December mailing to 25,000 AIA members, which we’re glad to report inspired another 40 architects to sponsor the resolution. 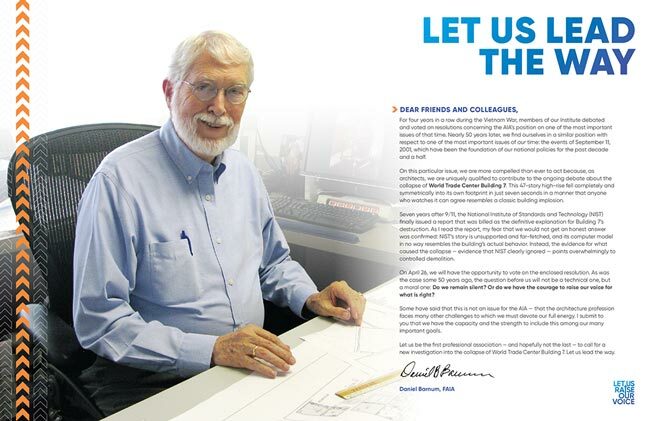 Read the letter from Dan Barnum to 2,500 AIA leaders. Since we don’t have an expensive booth to pay for, our entire campaign this year will cost only $10,000. That’ll allow us to reach 2,500 AIA leaders with our dynamite mailer and will send six of our staff members and volunteers to the four-day convention in Orlando. Help us reach this goal by chipping in what you can. 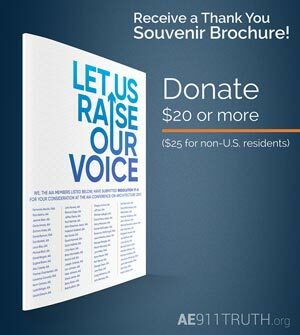 If you donate $20 or more ($25 for non-U.S. residents), we’ll also send you a souvenir mailer as a token of our thanks! Because of your support for these groundbreaking campaigns, we’ve gained more traction with the AIA membership in the past two years than in the previous eight. We are ever grateful for your steadfast commitment as we attempt to awaken the architecture and engineering communities to the need for a new WTC investigation.